Our latest work day was on 21 May; our thanks to the "friends" who turned out on a vaguely inclement day to help our Park Ranger with a diverse list of jobs. The majority of the work involved wheel barrowing wood-chips to cover the newly paved pathways at the top entrance. In autumn and winter these paths are quagmires of mud; the chalk has raised the path level, hopefully above the shallow water table, to enable access during the wet weeks. Thank you to those passing by, who took the time to talk and welcome this improvement as we worked. The chalk was shipped and laid by a community pay-back team, who deserve our thanks for doing the heavy work. Sycamore trees in the copse are abundant, and are fast growing, from the numerous seedlings that find it easy to establish themselves on the woodland floor. Some of our time on the workday was spent cutting back the voracious growth as they threaten to impede the steps and paths through the woods. The sycamore has had a controversial reputation; gardeners dislike them because of the large volume of foliage they shed in autumn, and the thousands of seedlings they produce, but they are planted frequently to quickly establish shady areas in large landscapes. They are a relative recent immigrant to the British Isles, becoming established in the early 1800s, but continuing to thrive ever since. Insects and birds now depend on them, so they are an established piece of our woodland ecology. A few weeks ago one of our members bumped into an artist in the copse, drawing the view from the top of the meadow, south towards the sea. 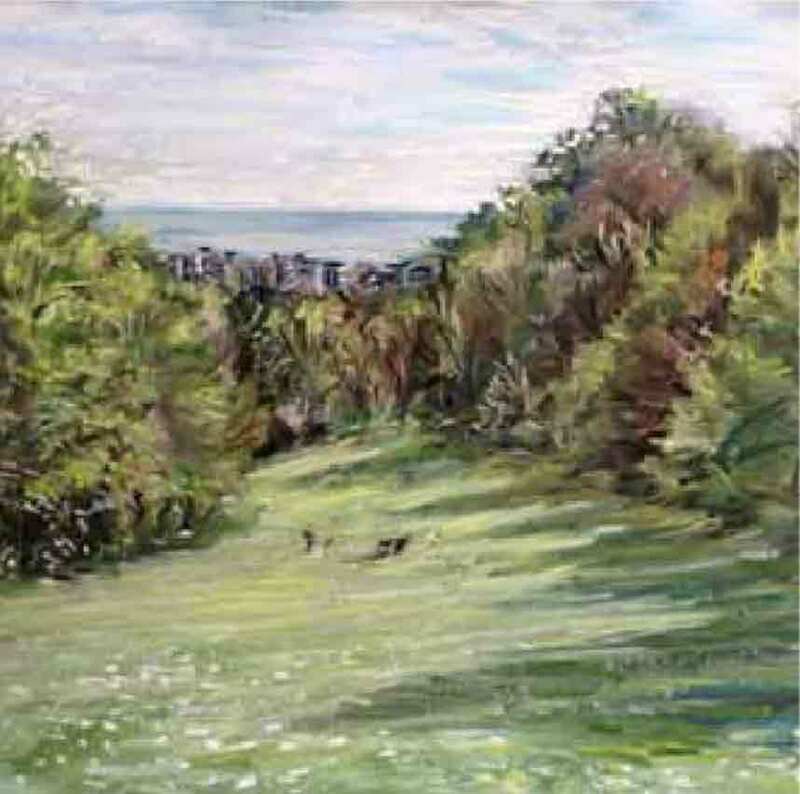 This turned out to be Nate Cordery, a local artist, who has captured the view superbly, the wall of green shrubs and trees bordering the meadow, with the sea in the distance. The copse picture is part of Nate's 'En Plein Air' series. He is putting together a series of works captured in the open air, mainly in local locations. He's done work over on Green Ridge and in Stanmer Park, for example. The copse work was done in soft pastels on paper; he also works in water colours and in acrylic paint on board. To see these and other works by this local talent, look at Nate's Facebook page (https://www.facebook.com/natcordery). Our next work day is on 23 July, all welcome. Please check our Facebook page or threecorneredcopse.org.uk for confirmation.